Irish setting pdf, D major: Mrs. McLeod of Rosses – from Kerr’s Merrie Melodies, Vol XI. New England setting pdf with bowing vocables: with French lyric from Madame Bolduc “Tout le monde a la grippe” performed by Josée Vachon. Acadian setting, G major: from Québecois fiddler Claude Méthé. Appalachian Old-Time setting pdf, A major: Hop High Ladies, with words from Uncle Dave Macon & Fields Ward. Blues setting pdf, G minor: Miz McLeod’s Holler © 2004 Donna Hébert – Donna took the shape of the tune and reset it to a blues scale (minor). Who is this Mrs. McLeod? Sometimes she’s Mrs., sometimes she’s Miss; in Ireland she’s Mc and in Scotland she’s Mac, but wherever she lands, she’s a fine fiddle tune! With more than 30 different names (see the entry in Andrew Kuntz’s The Fiddlers’ Companion for more names & settings) and dozens of different but related melodies, Mrs. McLeod’s Reel is a tune with a long history. An early setting was collected by Scots fiddling master Neil Gow around 1800 from a Mr. MacLeod on the Isle of Skye and the title is also referred to in Irish literature in the late 1700s. English novelist Thomas Hardy, a fiddler himself, mentions the tune in “The Mayor of Casterbridge.” When it crossed the seas to the new world, McLeod’s worked its way both North and South, picking up and dropping parts, changing keys, even acquiring words in both English and French. 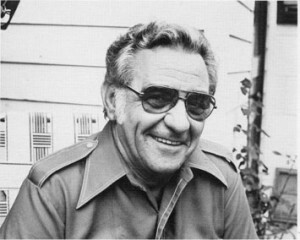 After rolling out West, it eventually became the centerpiece of American composer Aaron Copeland’s “Rodeo”. Not bad for an immigrant Scots-Irish fiddle tune! Six variants of McLeod’s are collected here. Five are culled directly from the regional fiddling traditions they represent and the last one is an original blues setting of my own. There were many settings to choose from, but these were the most fun to play – probably the deciding factor for fiddlers! The Scots, Irish and New England settings were found in older collections. 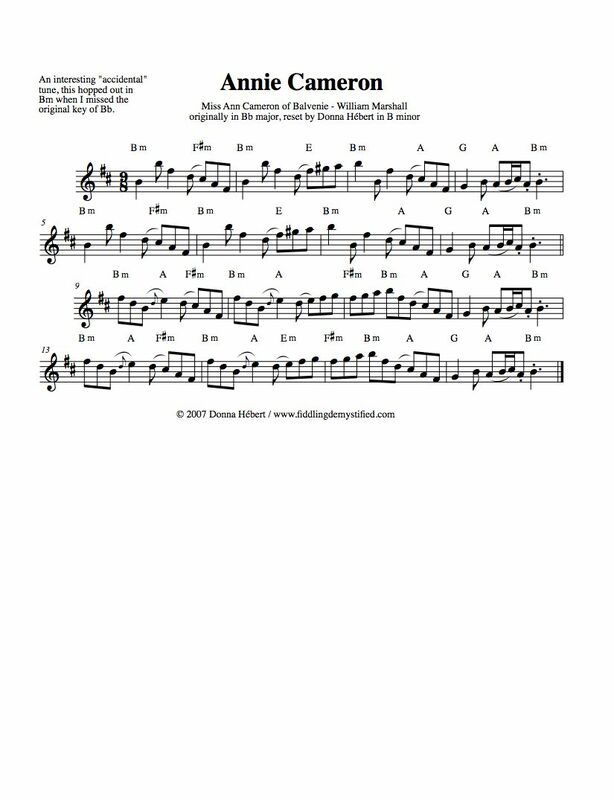 I learned the Scots strathspey in A major from one of Neil Gow’s collections many years ago, about the same time I learned the New England setting in G major from ‘Ryan’s Mammoth Collection” (formerly published as “Cole’s 1000 Fiddle Tunes”). The Irish setting in D major, “Miss McLeod of Rosses” is different from both the Scots and New England tune shapes, but still sounds enough like its parent to claim heritage. I found it in Kerr’s Merrie Melodies, Vol. XI. Québecois singer Mary Travers, know in Québec as La Bolduc, used the New England setting in the 1930s for a song she called “Tout le monde a la grippe,” (everyone has a cold), which she wrote following an influenza epidemic. The nonsense syllable chorus, a French-Canadian turlutte, sings “tiddly-um ACHOO, ta-ta-tum, ta-ta deedle, da-da tum ACHOO, ta-ta-tum, ta-ta deedle da-da dum,” mimicking the sneezing cold sufferer. The CD song track (used with permission) is from Josée Vachon: ça fait rire les enfants, 1996 (available from Josée at www.joseevachon.com). I am fiddling on the track, and the sneezing chorus includes my daughter Molly, then aged 8. I first heard the Acadian French setting from my mentor Gerry Robichaud, a New Brunswick fiddler. Québecois fiddler Claude Méthé also shared his version with me and I use that setting here. I adore the three-phrase B part and the syncopation is very satisfying to play. Pay attention to the accented (>) driven bows in the style to make the rhythm pop. The Appalachian Old-Time setting was gleaned from jam sessions and is very close to the one I later found in the Scots collegion “Kerr’s Merrie Melodies, Vol I.”. In A major, it uses virtually the same melody as “Hop High Ladies,” as it’s often known in the Southern U.S. Played with characteristic open-string drones, this is a smoothly-bowed setting with two and three-note slurs across the downbeat to mark the rhythm. The last, blues setting, is one I composed, resetting the shape of the melody over a blues scale, turning it minor. Each tune setting incorporates a style lesson. Make the effort to get the bowing rhythms right and you’re 90 percent there. Go for the syncopated bowings (tied or driven bows in groups of two or three over the beat and bar line) and you can create a wonderful groove. Learn rhythmic bowings first, adding left-hand ornaments when the bowings are secured. Experienced fiddlers are constantly drumming new rhythms over a melody line; bowing is the “open sesame” to rhythmic improvisation. Playing along with the mp3 tracks while reading is a very effective way to learn the tune and understand how the groove changes from style to style. Style points for each tune are broken out on the lesson mp3s. Each tune is played several times through, then again on a second track with guitarist Max Cohen playing in standard tuning. Mrs. McLeod’s Reel is a grand old lady who has traveled far and wide to become a standard tune in many fiddling traditions. Playing the tune settings given here will help you appreciate and experience her journey. Bon voyage! © 2006 Donna Hébert, fiddlingdemystified.com. All rights reserved. 1. Breathe! And keep breathing. Don’t hold your breath when you learn or play – it starves your brain and your sound along with it. Breath awareness will keep you in the present and focused. 2. Play in front of a mirror! A picture is worth a thousand words. Look for where your movement is awkward. See if you can correct yourself by watching what you do and redirecting your movements. 3. Change your stance! If you play seated, stand up if possible. Walk around a bit while you’re playing to help your body relax and open up. If you sit, keep your spine erect and perch your hip-bones on the edge of the chair. Don’t sit back or slouch. 4. Easy does it! Approach playing fiddle lightly. A relaxed bow hold keeps you flexible and able to move in any direction. The same is true for the left arm. If you need a shoulder rest, find and use one that works for you. Don’t add tension to your hold in either hand. Instead, monitor yourself to see where you’re holding and then wait for the release. Remember to wait! 5. Listen before you play! Fiddle style is all in the ephemeral ornaments that curl around notes and in the rhythm that drives the tune, neither of which you’ll find notated in most tune collections. So listen-listen-listen! 6. Sing the tune! Doesn’t matter if you sing in tune – you are patterning the tune’s unique rhythms into your brain so you can retreive it later. Singing makes it physical, makes it real, makes it YOURS! If you can sing it, you can play it! 7. Learn something new every time you play! Find something new in every playing experience and you’ll find you are never bored with music. It can be as complex as a whole tune or as simple as a new way to finger an ornament, play a new chord or bow a lick. 8. Use all your senses! If you know you always hear a note a little sharp or flat, use your sight to help you find the right spot. After a while your ears will hear it right, too! If you primarily read music, try listening and singing along with your eyes closed to help wake up your ears. 9. Find shortcuts! Big improvements in playing technique can happen when we adjust our breathing, stance, bow and instrument holds. Also look for places where left-hand fingers can be left down to improve efficiency. 10. No shame – no blame! A wise man once said, “If you do not know a thing, you simply do not know it.” Take fear and blame out of the learning eperience and the result is a lifetime of creative and joyful self-education! Turning a tune inside out! What happens when you’re not paying attention? When it’s a piece of music, a simple slip like misreading the key signature can uncover a whole new interpretation of the melody and the harmony underpinning it. A little key change and suddenly it’s a whole new tune! So here is my minor update of a major slip jig (9/8) called Miss Ann Cameron of Balvenie. Try it out and then go back to your tunebooks and play some of those major tunes as minors instead. Who knows what you’ll find? My mother’s French immigrant family is very musical. While they gave up their language in an effort to assimilate and avoid discrimination, the music remained as a viable outlet for culture. Five of my her seven siblings played, as did both my maternal grandparents – fiddle, piano, tenor banjo, accordion, guitar, mandolin. 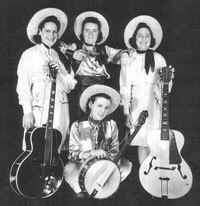 My mother sang and played the tenor banjo in bands in the thirties and forties, with her sister, Theresa. Their strict father fetched them home from Boston because, “nice girls didn’t go live in the city and become musicians.” They were good pickers too, and did a lot of harmony yodeling in their act. I recall my mom trying to teach me to yodel before my voice ever broke! She played tunes on the banjo, as well as backing up songs. So, as a child, while I didn’t play “Franco-American music,” I listened and learned technique and other musical skills. At 22, I was re-introduced to fiddle music through Dudley Laufman’s Canterbury Country Dance Orchestra, and what should I find but a re-creation (on a larger scale – not the kitchen but a town hall) of my grandmother’s kitchen soirées. I was hooked. About a third of the tunes had French names, but it wasn’t quite what I remembered. Then, after a year or so of sitting in at Dudley’s dances, I travelled to Barre, Vermont to see a fiddle contest at the invitation of my mother’s cousin, Clem Myers, who founded the Northeast Fiddlers’ Association. When I walked in, they were setting up for a band to play. Then Louis Beaudoin of Burlington, VT sat down on the stage, started clogging with his feet and began to play with members of his family. I was transported back to my grandmother’s kitchen junkets. I knew what I wanted. And I was beginning to know who I was. Later that year, at the French Club in Waltham, MA, I met Gerry Robichaud, an Acadian fiddler from Waltham MA, who’d come to the “Boston States” from Moncton, New Brunswick in the sixties. I heard some of my uncle’s fiddling in Gerry’s playing, which had a smoother, more rolling sound than Louis’ Québécois swing. I wanted all of it! The Acadian and the Québécois sounds made me happy, made me feel “at home” in the music. They excited me. I loved Irish and Scottish music, and New England dance tunes, but the French music made me grin like a fool, and I wanted to play it with the swing, the rhythms that came so naturally to Louis Beaudoin. With the French tunes, I was home. I loved Louis and Gerry as people and as musicians. Both the Beaudoin and Robichaud families welcomed me into their homes. In fact, it was like going as a child to visit on Sunday, which we’d always done. We’d go take a ride and drop in on a relative. Sometimes there would be music, always someone would be playing whist or gin rummy. Everyone brought food and news and shared both. So, woven in with the food and the visits with members of the Beaudoin family each time I was there (Louis had five daughters!) was the most incredible music. “Hey Donna, you know this one?” he’d say, and be off on another great tune. I’d scramble to put down my food and drink, grab my fiddle and try to follow him. Sometimes all I got was the rhythm of the tune as I tried to follow him through a crooked patch with extra beats. Other times I was able to play along with him in his incredibly danceable groove. What a gift that was, to be carried along by Louis’ rhythms, with his brother, Willie Beaudoin on guitar and daughter Lisa on feet and piano. Like a tidal wave, it carried me farther into the heart of the music than I ever could have come by myself. And suddenly, instead of looking at the music from the outside, I was playing from inside where all the music really was. It was as though, in an instant, I had gone from looking at a tree to being the tree. My world was forever changed. I came back to Louis Beaudoin’s soirées whenever I could until his death. And by then, I had also recorded an album for Alcazar with Gerry Robichaud, his brother Bobby Robichaud, and Tony Parkes. Working with Gerry to prepare for this album gave me a lot of time to watch and listen to him play. His groove was different, smoother, a little faster. And his tunes were terrific! So, after a year and a half of playing with Gerry every week, his style had begun to creep into mine, which was fine by me. It’s still there in my playing, as is “le swing” that I got from Louis Beaudoin, and that old fiddling sound that I first heard in my grandmother’s kitchen. So what does all this say about the music that I play and what it means to me? Well, I have chosen to make fiddle music, and particularly Franco-American fiddle music – its performance, documentation and transmission through teaching – my life’s work. And if this music is so essential to the lives of so many – myself, Josée Vachon, Gerry Robichaud, Joe Cormier, Louis Beaudoin, and so many others, then it is indeed vibrantly alive. The fact that young people are learning about their Franco-American cultural heritage through music, and that they are as excited about the songs, tunes and dances as I was then and still am now, reassures me that our culture lives. A New Year’s Resolution . . . play or practice? Play more music – every day! As someone who teaches and facilitates music for others on a daily basis, it’s important to look at my own music with the same critical ear and eye. A friend once asked me, “you teach a lot, but how much do you practice?” A thought-provoking question, this changed my musical landscape and brought true practice back into it. Practicing is just focused playing – you’re jamming alone with an agenda. Choose one piece or medley to work on for each session; don’t spread yourself too thin. You might like to keep a music diary, noting the date, what you worked on, any insights and further goals for that piece. Please remember to be nice to yourself. No shame, no blame! Keep it fun and you’ll learn a lot more. When working on something for performance or recording, I deconstruct the tune, listening to myself play the component parts, the transitions, the pitches, the tricky passages, the underlying rhythms as well as the shifts or ornaments, listening for where to put dynamics and variations. Sometimes they are all in need of help and it’s hard to know where to start first. Rhythm is usually a good place to begin, making sure I’m locking into a groove as I play, nailing the beat each time in the same place to create a repetitive rhythm. Once that seems stable, I can listen to phrasing and pitches, flipping back and forth, listening to how a note sounds, then to how a whole phrase of notes sound. When I’m satisfied with that part, I can refocus, now on the transitions between phrases that make the tune flow smoothly into the next section. Next I work on is the ornamentation and dynamics. Both are style-specific, like rhythm and the placement of the beat (in front of, in the middle of or behind the downbeat). Ornaments are often a combination of right and left hand movements, but some are played with only one hand or the other. It helps to identify and learn these style markers and ornaments in a particular style you might be drawn to – it makes you sound much more authentic and “in the groove” in that style. The last part of the puzzle is finding variations. When you are able to tweak the rhythm, melody and ornaments into variations, that’s when you really KNOW the tune. Usually it comes faster when you learn the tune by ear or are OFF the page. It doesn’t have to be big variations to do the trick. Swapping out one ornament for another will often work, as will replacing an even “One-and-two-and One-and-two-and” rhythm with a syncopated 3-3-2 rhythm like “One-two-three, One-two-three, One-two”. These syncopated rhythmic variations are my favorite! 1. Rhythm – Learn bowings FIRST – they create rhythm and underpin the tune and style. Play a downbeat or offbeat accent. Place beat directly on, in front of, or after the beat, creating swing (or not) this way. Accent off-beats in 2/4 dance tunes. Jigs accent the downbeat (ONE-two-three TWO-two-three. Marches accent the one as well (ONE-two-three-four). Most waltzes accent the one and three (ONE-two-THREE, ONE-two-THREE), while Cajun waltzes accent the two (one-TWO-three, one-TWO-three). 2. Melody/Pitch – Play slowly to hear individual notes. Take none for granted. Listen to each one singly and as part of a phrase – it needs to fit both ways. Play scales and arpeggios in the tune’s key to refresh your pitch memory. 3. Phrasing & voicing – Phrasing is how rhythm is created with bowing and slurs. Change voicings by using fourth finger instead of open strings or single-string shifts instead of string changes, especially in slow tunes. Slur across the beat to create a forward-moving dance groove and a subtle form of syncopation. 4. Transitions – How phrases begin and end defines the flow of a tune. First and second endings often vary in the transition back into the phrase or forward into the next one. These subtle transition variations can cue experienced contradancers to what’s coming next. 5. Ornamentation – This adds the patina of style. Make sure your rhythm is solid in the style before adding this layer. Each style has a characteristic set of ornaments that help to define it. Irish and Scottish share some ornaments, but how they are used rhythmically ends up as the style boundary. There are also universal ornaments like 3+1 bowing that sound a little different in each style because of underlying groove or rhythm changes. 6. Dynamics & tone– Use upbows to create dynamics; starting on an upbow creates an automatic volume increase for a phrase. Irish jigs use this technique a lot. You’ll notice that tone is down the list from where it would be in a classical practice routine. Rhythm trumps tone in fast dance tunes. Slow tunes are another thing altogether – tone really counts there. To play well at any speed, practice the whole thing slowly: ornaments, dynamics, variations and all, to make sure you really have it before jumping to performance speed. 7. Variations – This starts to happen when you really know the tune and get just slightly BORED with it! We’re playing new rhythms over the melody instead of rewriting a melody as in jazz. It’s a tweak, not a whole new composition. Start by moving the ornaments around through the melody and see where they can enhance a new part of the tune. Then try syncopating rhythms under a phrase over the chords, dividing the bar in thirds instead of in half: use a 3-3-2 rhythm instead of 1-2-1-2. I find these are the two easiest ways to create variations – and they’re FUN! Which reminds me – gotta go practice play some music now . . .